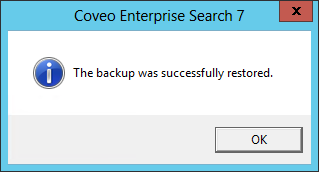 You can use the Coveo Enterprise Search index (CES) backup feature to regularly back up your Coveo index (see Backing Up the Index With a PowerShell Script). Following an unfortunate event where your index becomes unusable, you can efficiently restore your latest backup to avoid having to rebuild all your sources. Ensure that the hard disk on which the Coveo index resides has sufficient free space to receive the restored backup. Note: When the corrupted index files are in their original location, they will be overwritten by the restored backup files, thus not requiring more disk space. If you renamed the folder of the corrupted index files, the original folders will be recreated with the restored backup files, thus doubling the required disk space. When it is not already the case, stop the CES service (see Stopping the CES Service). Change to the Coveo Enterprise Search Bin folder (C:\Program Files\Coveo Enterprise Search 7\Bin by default). Important: You cannot restore backups made with versions prior to CES 7.0.7022 (September 2014 monthly release) since the BackupInfo file has a different format. The -verbose parameter at the end is necessary if you want to be notified when the backup is restored. The backed up index files are restored to their original location, overwriting files if they are still there. The following dialog box appears when the restore process is completed. Important: If the backup restore fails or is interrupted, you will not be able to restart the CES service until you successfully restore an index or delete it and rebuild it. When the restore operation is completed, restart the CES service (see Starting the CES Service).